Perhaps the most haunting and tragic love story ever written, Wuthering Heights is the tale of Heathcliff, a brooding, troubled orphan, and his doomed love for Catherine Earnshaw. His desire for her leads him to madness when Catherine is made to marry a wealthy lord, sending Heathcliff on a lifelong quest to avenge himself upon those who stole his only love and his life. In this gripping chronicle of the never-ending conflict between the heart and the mind-and the pain and passion of true romance-Emily Brontë created an unforgettable classic saga of love, desperation, vengeance, and forgiveness. 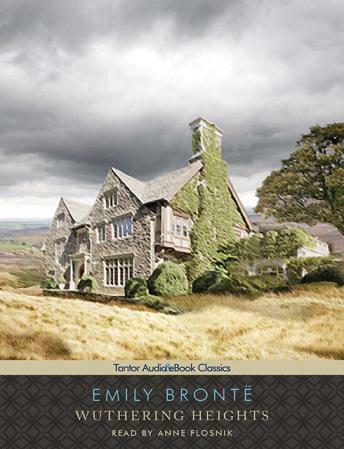 Published just one year before Brontë's death in 1848 at the age of thirty, Wuthering Heights endures as one of the world's greatest love stories and a classic of English literature. I felt that this Classic story read like a young adult book; the characters are not well developed or realistic. The narration was a difficult matter, since the story is narrated by a man and by a woman. Those who produced this recording chose a woman who was very bad at doing a male voice. It was the poorest narrated audio book I have heard. She also was hopeless at doing the regional accent of one of the characters. This is difficult to do but surely could have been done better that it was done on this recording.